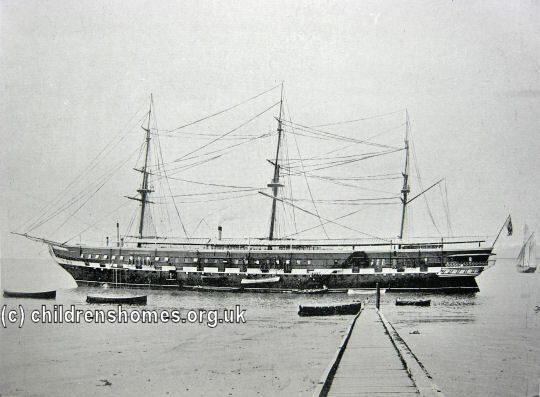 The Training Ship Shaftesbury was established in 1878 by the London School Board, one of the many such bodies created following the 1870 Elementary Education Act. 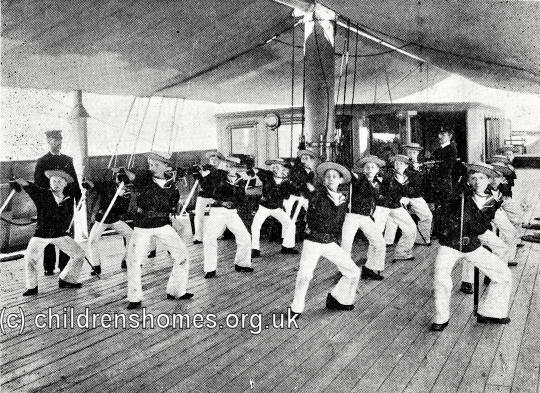 The Board decided that a Training Ship would be a good way of dealing with problem boys, such as persistent truants. Perhaps because of this, a request to the Admiralty for the loan of a suitable ship proved unsuccessful and the Board spent £7,000 on the purchase of a former P&O vessel, the Nubia. The ship, renamed Shaftesbury, was moored on the River Thames, off Grays, not far from another training ship, the Exmouth. 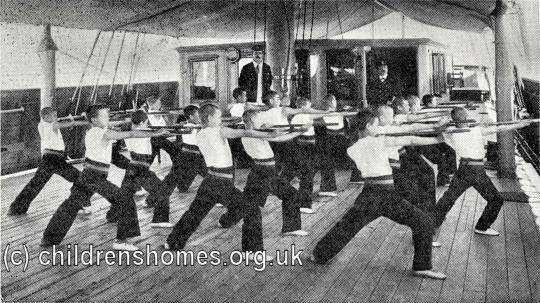 On July 31st, 1878, the Shaftesbury officially certified as an Industrial School Ship to accommodate 350 boys, aged 12-14, up to 70 of whom could be Roman Catholics. The first boys were received on August 8th, 1873. The ship's capacity was raised to 500 in 1881 then lowered to 400 in 1899. 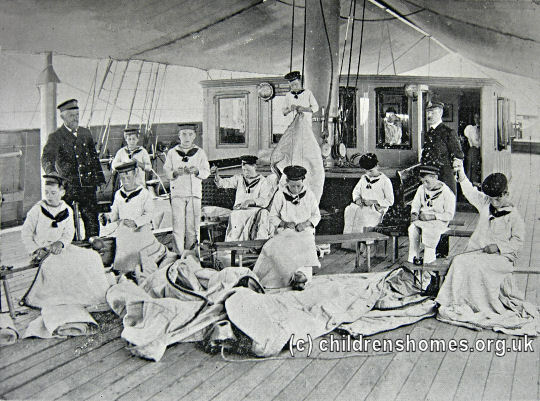 On board the ship, the boys slept on all the decks in hammocks slung from the ceiling. The hammocks were stowed in bags during the day. For half the day, the boys received basic classroom education. The rest of the time was devoted to training in nautical matters and a variety of other skills such as tailoring, boot and shoe making, carpentry, and laundry work. 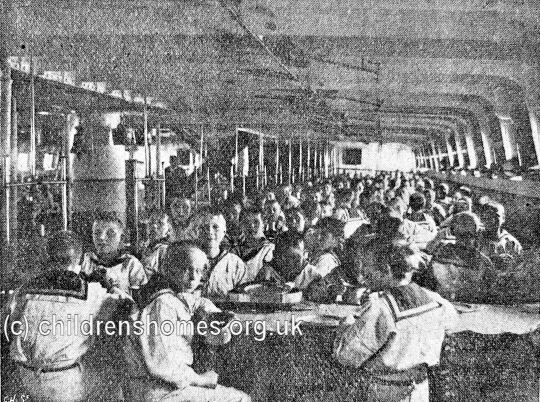 The ship had its own band where boys could develop their musical talents. On the night of January 18th, 1881, a terrible storm led to the Shaftesbury breaking away from her moorings and being in considerable danger for a while. The ship then spent some time moored at Greenhithe. 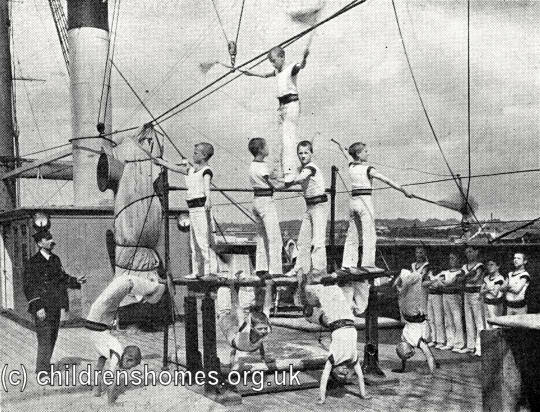 The Shaftesbury had two sea-going tenders which gave the boys practical experience of seamanship. The first was the Swift, replaced in 1886 by the schooner Themis which could accommodate 35 boys plus a master and mate. Discipline aboard the tender was somewhat laxer than on the Shaftesbury and boys sometimes absconded. From June, 1899, to April, 1901, the Shaftesbury had an Auxiliary Home at 43 Loudoun Square, Bute Street, Cardiff. The home provided short-term hostel accommodation for former Shaftesbury boys when their ships docked at the port. In 1904, the London School Board was abolished and its responsibilities passed to the London County Council. On discovering that the Shaftesbury required extensive repairs, the Council decided to scrap the ship and the School was closed, formally relinquishing its licence on April 15th, 1905. The vessel was sold off the following year and was broken up. London Metropolitan Archives, 40 Northampton Road, London EC1R OHB. (The Ancestry website also has LMA records relating to workhouses and other institutions — more details.) Few records appear to survive.